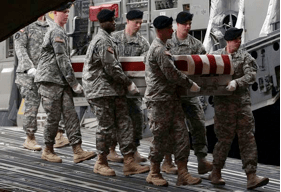 It’s called it a Dignified Transfer, which is Pentagon-ese for bringing home the body of one of our young men. On my recent embed in Kandahar, Afghanistan, I flew there from Camp Bastion on a cargo flight. The plane was virtually empty: four passengers and me, the small Air Force crew and, covered by an American flag, the remains of a serviceman killed that morning by an IED in Helmand Province. The military’s goal is to bring our dead back home within 48 hours, and this was the first leg of such a journey. Usually flights into Kandahar are lively as the troops and private contractors are heading home from here. People are relaxed, reading paperbacks, listening to their iPods, or trying to talk. But not today; the only sound was that of the plane’s engines. Most of our group had their heads down. When I saw someone move, it was one of the Air Force crew adjusting the flag draping the young man. I couldn’t take my eyes off the flag. Unlike 99 percent of the media who cover the war, I’m not an impartial observer; my son is active-service with multiple deployments under his belt. I know too many Marines in this age group not to be affected by this young man’s sad trip home; I imagined my son or one of his friends coming home the same way. How would I react I wondered (as do many of us parents of deployed sons) if they came and knocked on my front door? After we landed, our plane came to a halt in a corner of the airfield, away from the daily bustle of troops, contractors and cargo pallets. The rear of the plane opened to reveal a small honor guard assembled to ready him for his final flight home. As our small group prepared to walk off the plane through the forward hatch, a Marine Chief Warrant Officer and I lagged behind to pay our respects to the young man. 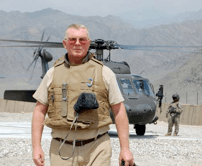 The Gunner removed his Kevlar and bowed his head, and I, a non-practicing Roman Catholic, offered a sign of the cross before the Air Force crew gently pushed us to depart. I wanted to stay and watch the ceremony, but with one of the crew shaking his head, I grabbed my bag and hurried to catch up to our group. Walking to the terminal all I could think about was how fiercely proud I hope his family is of him. Oh, young man, you’ll be missed. Andrew Lubin is a foreign policy-defense analyst and author specializing in military, foreign policy, and defense issues. From Ramadi to Fallujah to Garmsir, he’s brought America the stories of our deployed men and women in Iraq, Afghanistan, Haiti, and Beirut.